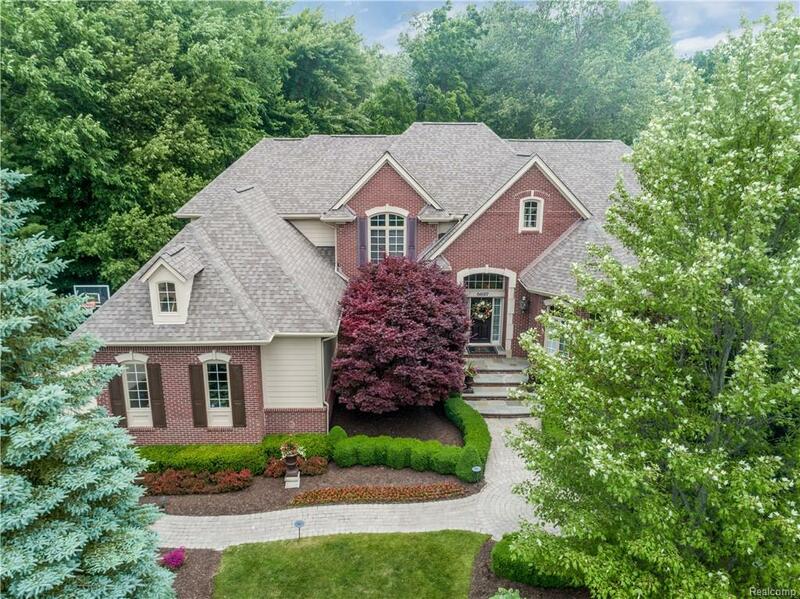 This gorgeous Moceri-built home is located on one of the largest, most beautiful lots in Kingspointe! Beautifully decorated and lovingly maintained, with premium architectural details! Hardwood floors, volume tray and octagon ceilings, premium moldings, and custom window treatments. The kitchen is large and inviting featuring breakfast area with sweeping views of the grounds, spacious island, walk-in pantry, granite counter tops, high-end appliances, a cozy sitting area with dual fireplace, and door wall to the deck. The fabulous great room offers a drop-dead gorgeous view all year long! The main floor master is a sanctuary with 2 walk-in closets, updated bath, 42" vanity, separate shower and soaking tub. The upper level features 3 generous bedrooms, an ensuite with bath and 2 addl bedrooms with Jack and Jill. The lower level is a whole apartment by itself! Impeccably finished with a custom kitchen area, family room w/fp, bedroom, full bath & office. See feature sheet for updates!